But is government really on our back or is the case really that corporations and wealthy interests are on government’s back? There are 40,000 or more lobbyists in Washington, DC. They are there for the purposes of extracting taxpayer money for their corporate sponsors’ benefits and for no other reason. The notion that taxpayer money goes to provide benefits for taxpayers, especially middle class taxpayers, is rather naive. Taxpayer money goes to provide benefits for large corporations and the wealthy because the poor can’t afford lobbyists. And the union movement is practically dead so union money is not influencing legislators to any great extent. Republican Governors like Scott Walker are doing their level best to kill off the remaining unions so that corporate sponsored lobbyists will have full sway in Washington. They aren’t there to help the middle class; that’s for sure. They are there to write legislation favorable to their own interests whether they be defense contractors lobbying for more money for military hardware or corporate flacks trying to drill holes in the tax code or lower the corporate tax rate. The notion that a lower corporate tax rate combined with closing the loopholes is preferable is naive since lobbyists will only then proceed to drill new loopholes into the tax code at the lower rate. Republicans argue that any expiration of a “temporary” tax cut such as the Bush tax cuts is actually a tax increase, but Michelle Bachman said on Meet the Press that she wouldn’t be in favor of extending the “temporary” reduction in the payroll tax rate because “we can’t afford it.” Yet we can afford, according to her, to continue the temporary Bush tax cuts which amount to a whole hellava lot more. Why won’t Bachman apply the same logic to the temporary payroll tax cuts? I’ll tell you why. Because the payroll tax affects mainly the poor and middle class. It’s a regressive tax that’s used to pay social security recipients and for many years the excess was just combined with income tax revenues and spent in the General Fund. So General Fund expenditures were partially funded by a regressive tax on the poor. Right wingers love to point out that the poor and lower middle class pay hardly any income tax. What they don’t point out is that they pay excessive payroll taxes, taxes that allow for no deductions or exemptions. For instance, if you’re a poor self-employed worker earning $10,000 a year, you will pay over $1500. in payroll taxes no matter how many children you have or how many medical expenses or anything else. You will pay at a tax rate of 15.3% (except for this year for which there is a 2% reduction for employees), more than a hedge fund manager pays. Capital gains are taxed at only 15%. Is that fair? Of course not. As long as the money is being spent in the General Fund and treated as income tax revenue, deductions and exemptions should be allowed for payroll taxes which affect mainly the poor just as they are for income taxes which affect mainly the rich. 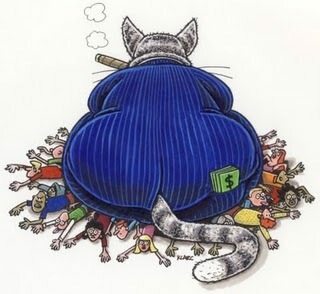 When right wingers point out that the poor don’t pay any income tax, they fail to point out that the poor, especially the poor self-employed, pay a higher rate, when you consider payroll taxes, than rich hedge fund managers including Warren Buffet. Please note that the rich pay hardly any payroll taxes and have voluminous deductions and exemptions on their income taxes. Sorry, I guess I am the only one who sees reductions in the collection for social security as creating a problem for the system. You don’t seem to understand that the payroll tax for social security will be returned in retirement and is not meant to be a general fund revenue source. Your focus on the collection of social security funds without even mentioning the return of funds in retirement is completely unfair and deceptive. Your argument that social security is just a regressive tax without discussing the future benefits for the poor is just a ‘George Bush’ type attack on the system. “Capital gains are taxed at only 15%. Is that fair?” Of course it is fair. The reason you don’t understand the difference between earned income and capital gain returns is that you don’t include risk. There is very little risk that an employee will not be paid for a years work. There is no risk of losing money as an employee. The employee should reasonable expect a years pay without risk for a years work. An investor has no guarantee of any return on his capital for a year. He risk making no money. An investor has no guarantee his capital will even be returned. He has a risk of a complete or partial loss of his investment. Working for pay does no include these risks. So to be fair, if the government is going to tax capital gains at the same rate as income, they should eliminate investment risk, they should guarantee the investor against a loss and guarantee a return for the use of the capital. Otherwise, a lower capital gains rate is completely fair for the risk taken. Newer Article: What is Bonnie Dumanis doing by skipping the mayoral debates?